With the arrival of summer some things are a given: ice cream after dinner, beach time, beautiful summer flowers, cool ocean breezes, sea food, seasonal farm fruits and vegetables, family time, frozen ice pops, and road trips! One of the most iconic road trips ever filmed was the 1967 film, Two for the Road, starring Albert Finney and Audrey Hepburn. It is set in Europe as the couple drives from the northern part of France to the south of France. The film has the most wonderful flashbacks to other road trips that the couple took during the course of their 10 year marriage. I can guarantee you that as wonderful as this film was it would have benefited for our Road Trip tips to make it even better. If you have a couple of hours rent this film on a lazy rainy Sunday afternoon. You won’t be disappointed. 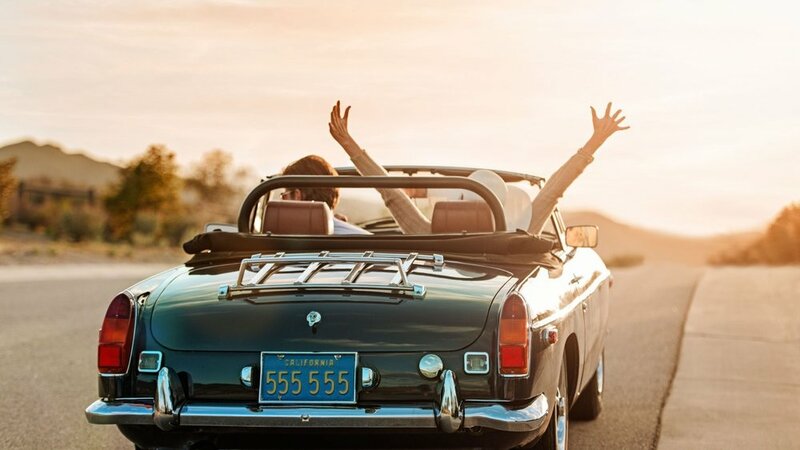 In the meantime read our tips below for getting ready for your own road trip. This is our guide to road trips. Follow our advice and your trip will be stress free and enjoyable. One of my fondest memories is of the family trip I took with my parents every year to a place in Hot Springs, Virginia, called The Homestead. My mother always prepared for our trip so that I was occupied with books and snacks. But today there are many more ways that you can prepare whether you are traveling with your girlfriends, your significant other or your family with children. With the advent of apps for directions it is smart to use both Waze and Google Maps. You can plug in your starting point and your destination and see alternate routes, traffic, police (to avoid those speeding tickets) and other pertinent route information. Check where the gas stations and the rest stops are especially if you are traveling with little ones! We drive primarily in the Northeast and know that from Montreal on I-89 there are very few rest stops and gas stations close to the highway so we have learned to plan accordingly. Depending on the length of your road trip you might want to do some research of places to stop along the way. Use this as a good opportunity to try different regional cuisines Be adventurous. Our go-to sites to check out restaurants when we are traveling by car are the Food Channel’s: Driver, Diners and Dives hosted by Guy Fieri and Trip Advisor. Think of it this way – do you really want to be schlepping multiple bags in and out of the car? It might be great for your forearms but it isn’t the best use of your energy. We suggest packing things that are light and can be worn in a variety of ways – such as a pair of black or white jeans that can be paired with either sneakers (see our favorites this season) or our new favorite comfortable heels from Cole Haan. Pack something comfortable to travel in much like what we suggest when flying (see article here). We’ve written extensively about the horrors of processed snack foods so we strongly suggest you follow our snack ideas. Pack things that are easily transportable and non-perishable. Bear in mind that salty foods will make you thirsty, which will make you drink more which will make you stop more! Opt for roasted nuts, homemade power bars, cookies and some protein. Pack a cooler with frozen ice packs and lots of drinks. Fresh fruits such as cherries, melon slices, and blueberries make great snacks. For kids, yogurt pops (in those squeezable packages), homemade gold fish pretzels and juice boxes. Pack reusable water bottles for space saving and fill them the night before your trip leaving an inch or so at the top and put them in the freezer for the next day. Put a bunch of them in the cooler and this will act as ice packs. Don’t forget paper napkins and handy wipes for those messy hands and little faces. What’s a road trip without songs that bring back a blast from the past? It’s a right of passage to be singing at the top of your lungs somewhere along the trip! Make sure that you have downloaded your favorite tunes and don’t forget a couple of pairs of earphones. For the kiddies, download all their favorite movies and games along with earphones for each of them. There are also the classic car games such as twenty questions, tic-tac-toe, license plate map, restaurant race, I Spy, What if? And the license plate game. Don’t forget to bring pillows, blankets, and socks for naps. Make sure that your first aid kit is up to date and that all the products are current. Bring a traveling rain poncho, flashlight and lots of sunscreen. Remember that being in a car is like having your face in a reflector – the sun reflects off of the glass. Reapply sunscreen at least every two hours. Charger for your phone, IPAD, camera and computer and bring an external charger in case. As that old Roy Rodgers and Dale Evans song goes – Happy Trails to You!